Later, the same day that I spoke in the school and doctored the dear ladies foot from the pagan village, I saw one of the villagers carrying a big pig over his shoulder. I found out then that it was for the pig roast they were going to have in honor of the Cross coming to their village. 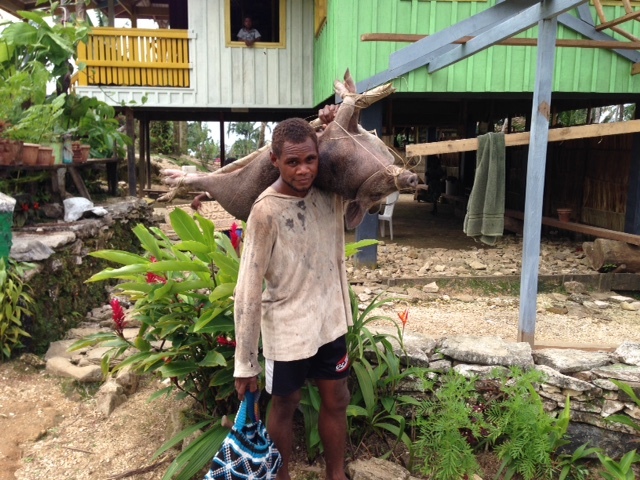 While they were preparing the pig, Robert took me on a tour of the village. I met his sweet parents and visited with them for a while. When we saw the smoke from the fire at the kitchen hut we headed back. 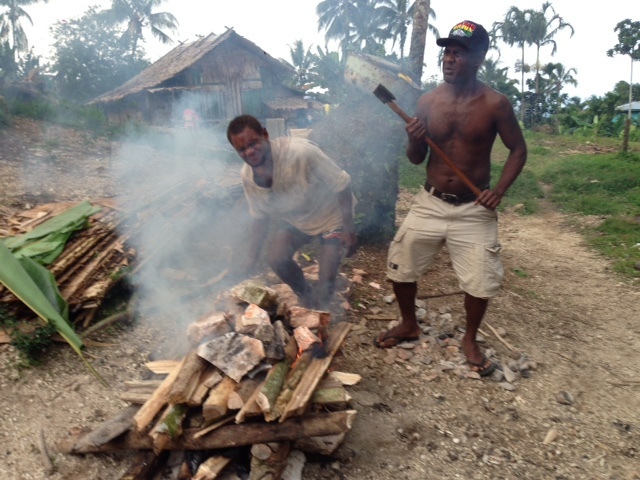 They were already throwing chunks of meat into the fire, right amongst the coals and ashes which is the way they cook. Being the guest of honor, they presented me with what they considered the best piece…the snout and top row of teeth and jaw, about 8-10 inches long. Yum!! or yikes!! 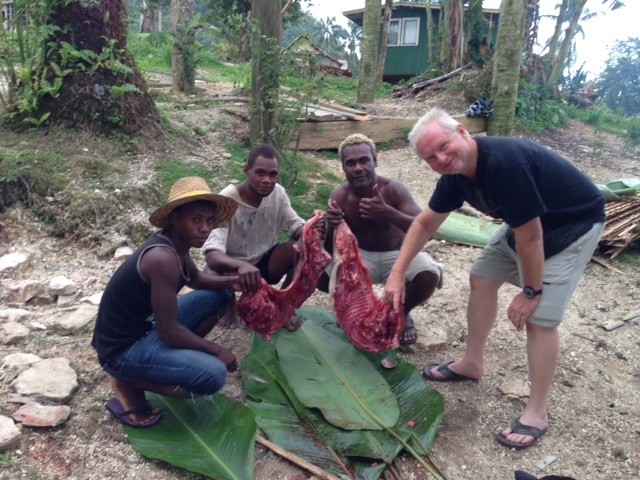 When the meat was cooked, we fished out the chunks with a stick or the bush knife, brushed off the ashes and put it on a banana leaf (our plate) and Bon Appetite!! I used my pocket knife to dig the meat out of the gums and jaw, lucky me! Then they prepared the fire for the big slabs of meat. It was interesting how they did it. They built 3 layers of logs over the fire and then threw big boulders on top. As the wood burned, the rocks would heat up and soon fall into the fire. They then laid the slabs on the rocks. When they were cooked, the rest of the village feasted. Robert’s dad came over to visit with me while we cooked. We had a wonderful talk, through an interpreter. 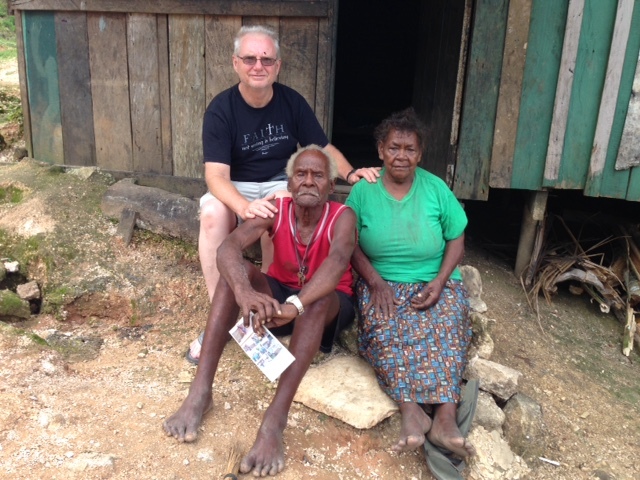 He shared how he had come to Christ and then moved with Roberts mother to this village, Nanakinnimai. He had been a witch doctor and chief of the pagan village before he gave his life to Christ in the revival there 50 years ago. He shared a story about a medical missionary who had been killed by the Kwaio people back in the late 1920’s. The beautiful thing that touched my heart so deeply was that the next morning he was waiting for me outside my hut when I got up because he felt that he had misled me in relaying the story of the missionary. It happened before he was born but the memories were so vivid in his childhood because it was talked about so much! He felt so bad about it sounding like he was actually alive when it happened that he felt like he had lied to me and could not sleep all night until he apologized to me!!! What a beautiful and sensitive heart. He loved Jesus so and would not offend his Lord by misleading me even a little! He had to make that right before I left! We could all learn from his wonderful example. What happened that night, I am still in awe of…words fail me to convey what happened next. So, stay tuned, I will post that soon. Right now we are in Vanuatu winding up the walk here. Keep praying, it too has been amazing! If you’re not familiar with our ministry you can learn a little more there. If you would like to help, it will tell you how or maybe be a part of the next trip to bring more bibles, school and medical supplies and teaching to the Kwaio people! To all of you who continue to be a part of the supply line and are praying for us, thanks for holding the Rope!! !